Hill 232 was a key strategic asset to the German defensive line during the Hürtgen campaign. 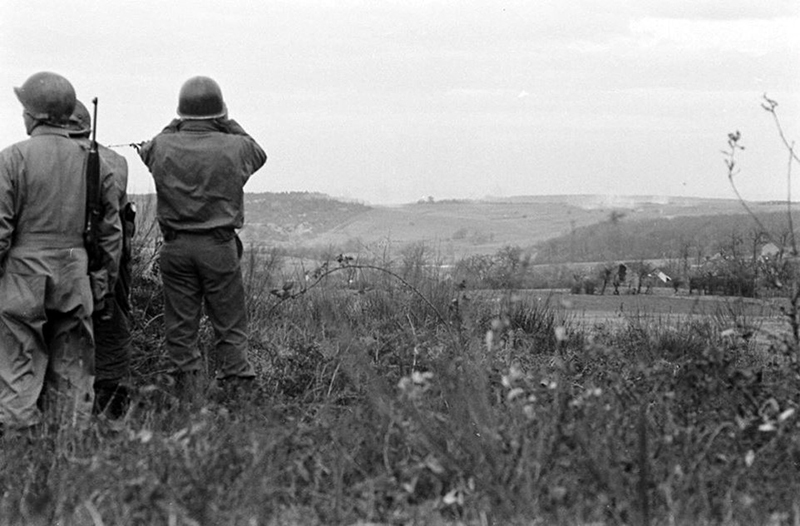 It provided the defenders a clear view of the surrounding area and according to the Company F history, “Even a field mouse could not have entered Hamich without being spotted from Hill 232.” The task of taking this formidable position fell to the men of the Second Battalion, 16th Infantry Regiment. 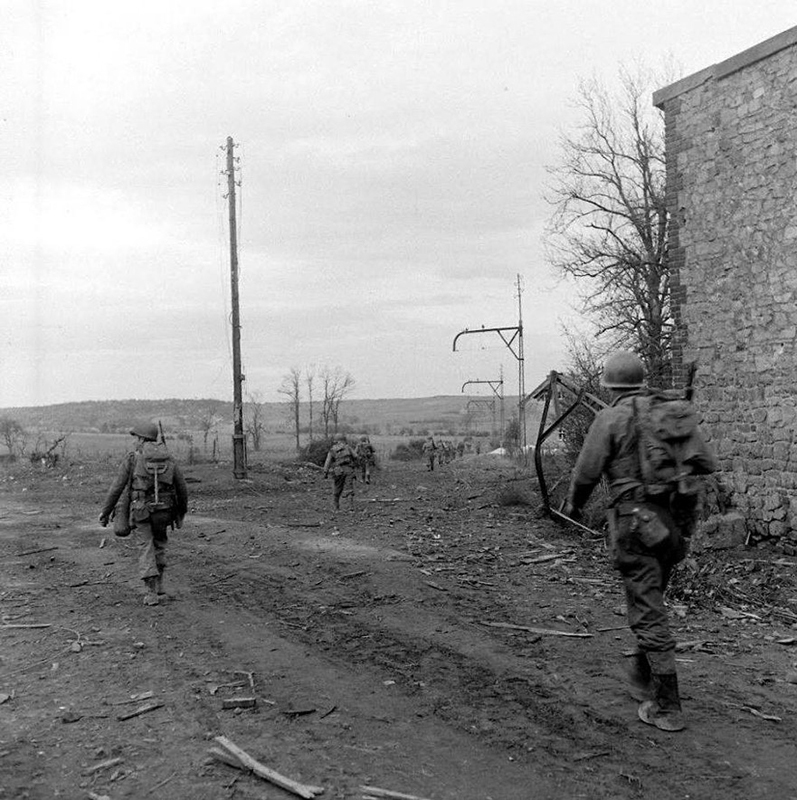 After the First and Third Battalions had fought their way inside the town of Hamich on the 18th of November 1944, the Second Battalion could begin their own attack and seize Hill 232. Troops of the 2nd Battalion, 16th Infantry advancing on Hill 232. During the day preceding the Second Battalion’s attack, November 17th 1944, elements from seventeen different Artillery Battalions were firing on Hill 232. This immense bombardment overwhelmed the men of the defending 12th Fusilier Battalion, 12th Volksgrenadier Division. The shelling served to soften up the German defences and halt any reinforcements from reaching the Hill to assist in repelling the American attack. The assault began at 1415 hours on November 18, 1944. The infantrymen of Second Battalion jumped off once word was received that Hamich was more or less secured. The Regimental Cannon Company and a number of 4.2 inch chemical mortars were assigned to the Battalion as close artillery support. Companies E and Company F advanced abreast with tank support from the 745th Tank Battalion, and Company G followed in reserve with the aim of passing through E and F Companies to secure a small ridge just beyond their objective. German trenchline of the 12th Fusilier Battalion, 12th Volksgrenadier Division on Hill 232. The attacking Second Battalion suffered few casualties taking Hill 232 when compared to the high rates suffered by their comrades in the First and Third Battalions during their struggle to take Hamich. Company F had only five men killed in action assaulting the hill and H Company only suffered casualties from friendly artillery after a series of short rounds hit their position. The supporting artillery fire was lifted after this incident to avoid any further mishaps. After a brief firefight, Hill 232 was secure and it was reported in the Regimental journal as being secured at 1545 hours. The infantry found a substantial number of enemy dead atop Hill 232 and took a large number of prisoners whom were in a dazed state after the heavy shelling from the American artillery. The top of the hill was covered in a vast trench network with an anti-tank ditch to assist in its defence. Once Hill 232 was secure, the men of the Second Battalion immediately began preparing the position for defence against enemy counter-attacks. Company E positioned itself on the western side of the hill and Company F secured the eastern face whilst Company G occupied a small ridge beyond. The weapons platoons from Company H dispersed themselves amongst the other companies to provide support. 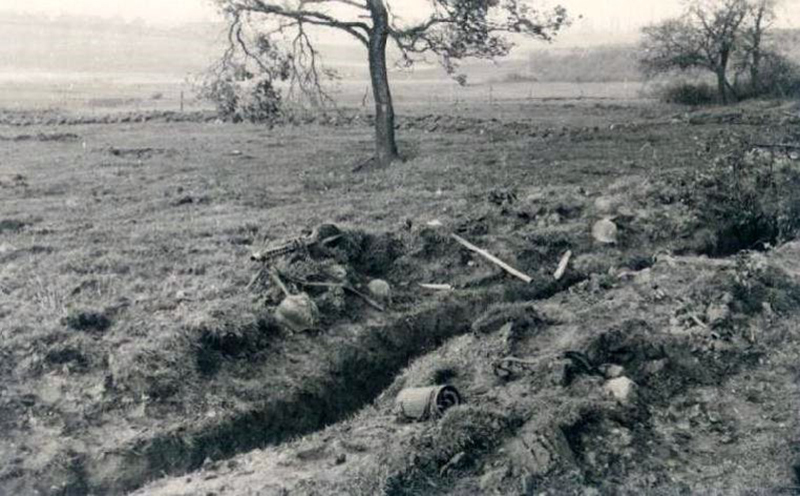 As the men began digging foxholes and slit trenches, German artillery began falling on the GIs intermittently and caused a number of casualties. This bombardment lasted throughout the day and long into the night. The expected attack did not come, although at roughly 1715 hours, Second Battalion came under intense automatic fire from the vicinity of Hamich and a machine-gun duel erupted between the two positions. This fire turned out to be troops from the Third Battalion who had mistaken several GIs for enemy troops on Hill 232. The firing came to an abrupt end once the mistake was realized and no casualties were reported from this incident. 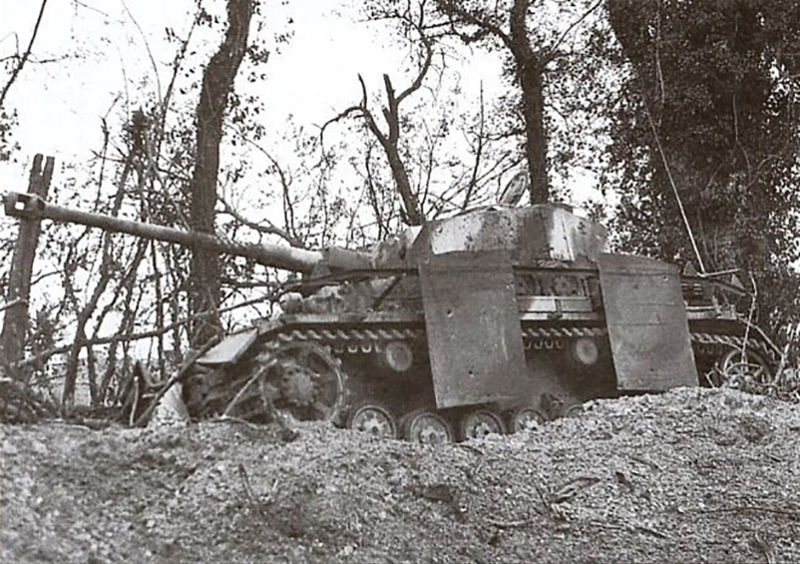 A German Panzer IV tank of the 116th Panzer Division destroyed during the counter-attack on the 19th of November. On the morning of the 19th November, the Germans made a concentrated effort to retake Hill 232. The attack began at 0530 hours and consisted of two reinforced rifle companies supported by armor. As the waves of German infantry advanced on the Americans, their supporting tanks remained in position 800 yards to the east and proceeded to engage U.S. machine-gun positions in order to knock out the allied defences. The supporting fire allowed several groups of attackers to break through the American positions and force several American platoons off the hilltop and back down the western slopes. The hill was retaken once again as the German attack began to stall due to the intense fire hitting their attacking infantry. The machine-guns of H Company proved vital in the defence of Hill 232 during this action and had been well positioned to provide clear fields of fire. Several of H Company’s machine-gun squads were overrun by the German infantry as several squads got close enough to hurl hand grenades at the American positions. As the fighting raged atop Hill 232, Company L from the Third Battalion was diverted from Hamich to assist Second Battalion in their defence. These additional forces managed to rapidly swing the balance in favour of the Americans and the German attack disintegrated after sustaining crippling losses. One German officer, captured in the assault on Hill 232, commented on the excellent positioning of machine-guns by the Americans that proved vital in breaking apart the German attack. Of the 66 men in his company starting the attack, only this officer emerged unscathed, although it is noted that he still had eight holes in his greatcoat from machine gun fire. After the attacking German units had pulled back, the Second Battalion went on the offensive. At 1400 hours, the infantry advanced roughly one thousand yards north of Hill 232 and established defensive positions. The effort to take Hill 232 did not prove to be as costly as Regimental command had anticipated. The original plan was for two Battalions to attack Hill 232 together, but after the disastrous assault on Hamich, this was no longer a possibility. The decision to continue the assault with one Battalion paid off and the objective was seized. By taking Hill 232 and Hamich, the 16th Infantry Regiment had dealt a severe blow to the German defence of the Hürtgen Forest from which it would not recover.